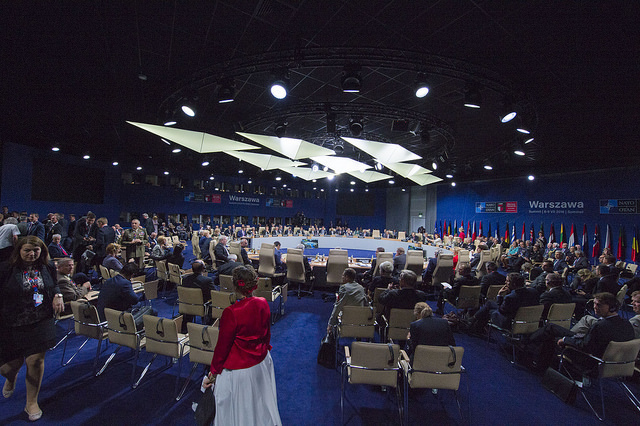 On Friday and Saturday (8-9 July 2016), the leaders of the 28 NATO Allies and many partner nations will meet for a landmark Warsaw Summit. Together, they will take decisions to enhance the Alliance’s security by strengthening its deterrence and defence, and projecting stability beyond its borders. The Warsaw Summit comes at a defining moment for the security of the North Atlantic Alliance. In recent years, the world has become more volatile and dangerous with Russia’s illegal annexation of Crimea and destabilisation of eastern Ukraine, as well as its military build-up from the Barents Sea to the Baltic, and from the Black Sea to the eastern Mediterranean; turmoil across the Middle East and North Africa, fuelling the biggest migrant and refugee crisis in Europe since World War Two; brutal attacks by ISIL and other terrorist groups, as well as cyber attacks, nuclear proliferation and ballistic missile threats. NATO member states form a unique community of values, committed to the principles of democracy, individual liberty and the rule of law. In today's dangerous world, transatlantic cooperation is needed more than ever. NATO embodies that cooperation, bringing to bear the strength and unity of North America and Europe.